It was my first time to Redang Island. Right after our holidays in Cambodia, Jam, his friend and I stayed one night at Tune Hotel KLIA-LCCT before flying off to Kuala Terengganu the next morning. Our flight was at 7am but we had to wake up at 4am to get ready. We took the bus which transferred passengers from Tune Hotel to LCCT terminal. At first I thought it was a free service, but later realized I had to pay RM1 for the short distance. As soon as we landed at Kuala Terengganu Sultan Mahmud Airport, we were transferred to Merang Jetty by bus. 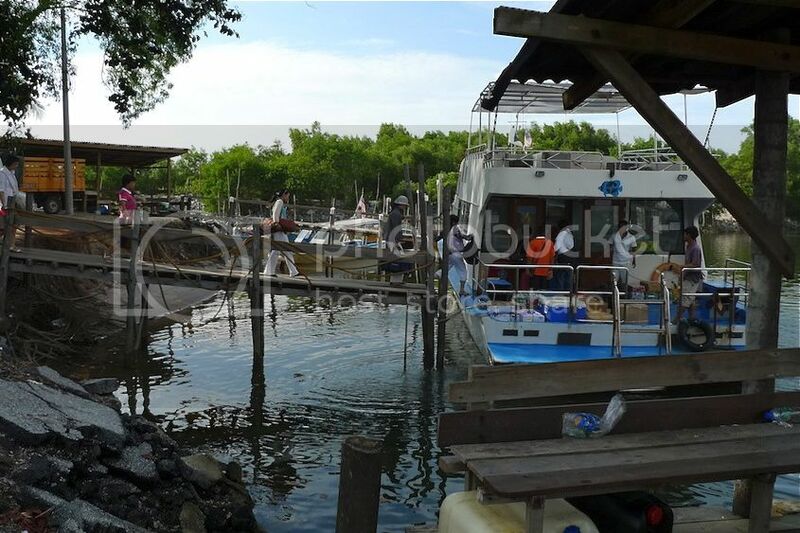 At the jetty, which is about 30km from the airport, there is a scheduled daily boat transfer to Redang Island at about 9am. We had to make sure we reach the jetty on time or we would miss the boat! In which case, we would have to fork out RM50 per person for ferry transfer! Fortunately, we made it on time. Luckily too, there were no delay in the AirAsia flight! 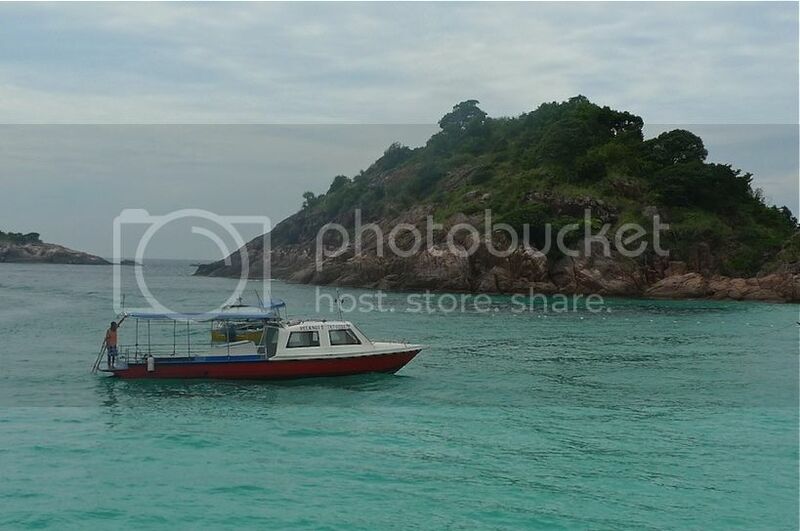 We had purchased this snorkeling package with Redang Pelangi Resort which includes the bus transfer from the Sultan Mahmud Airport and boat transfers from Merang Jetty to Redang Island and back. Soon our boat arrived and we got onto it. 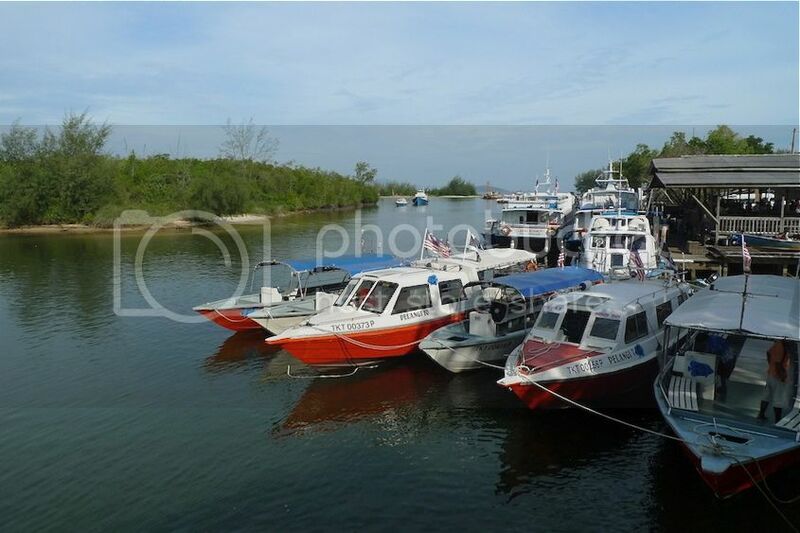 The boats at Merang Jetty. 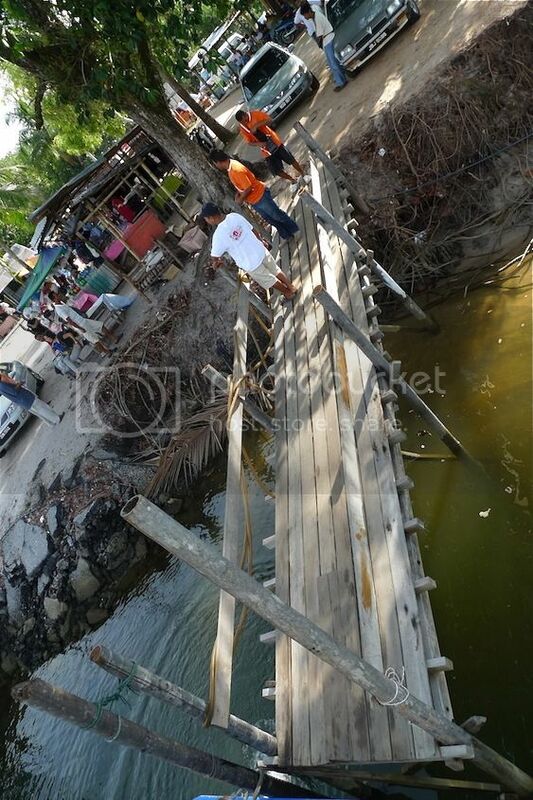 The wooden walkway to the boat. Our boat has 2 decks. We chose the upper deck for a better view. 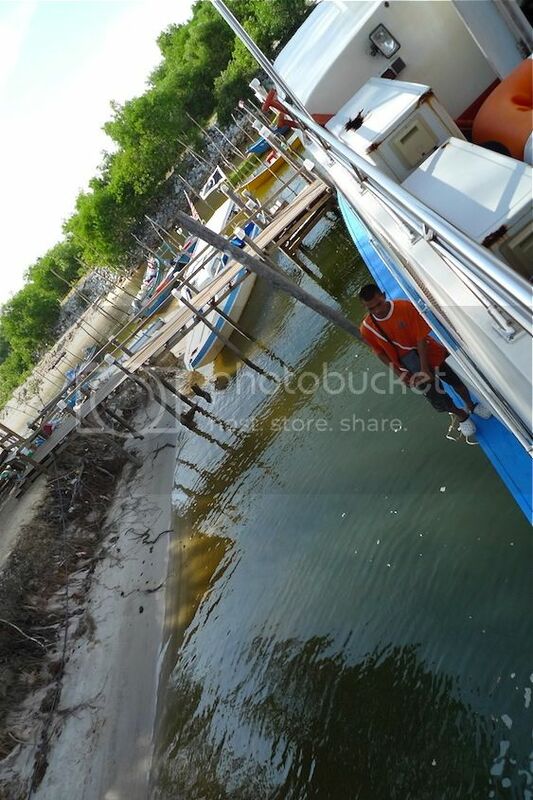 Soon, our journey to Redang Island began. 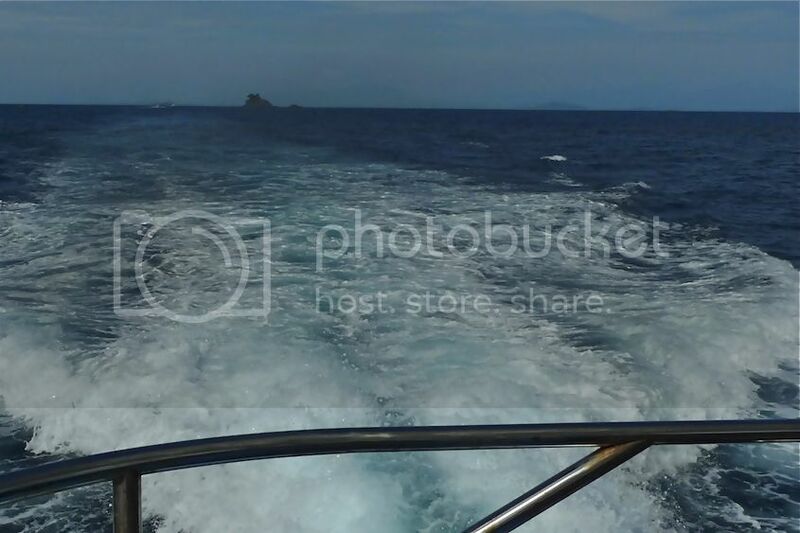 We were out in the open sea in no time, but the journey was rather long. About one hour and 45 minutes long, if not mistaken. Since I only slept about 1 hour the night before, I felt really sleepy but it was quite impossible to sleep in the rocking boat. Look! I was not the only one sleeping! Haha! Soon, the island came into sight. 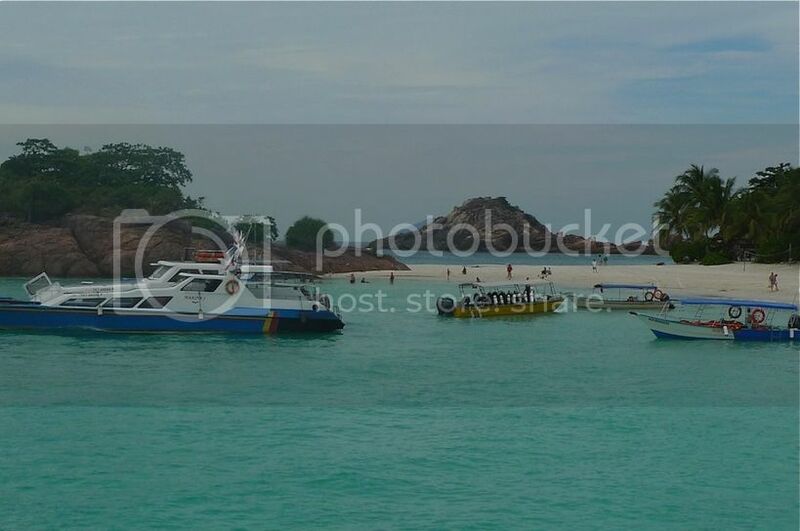 We landed at Pasir Panjang Beach, which is the largest beach on the eastern side of Redang Island. I always love the view when approaching an island. Love the clear green water! Surprisingly, I did not take many pictures during my Redang trip. Perhaps because I spent most of the time either snorkeling or eating. Taking along the camera would be such a hassle! There were many resorts along Pasir Panjang Beach (possibly close to a dozen!) - some more luxurious than others. 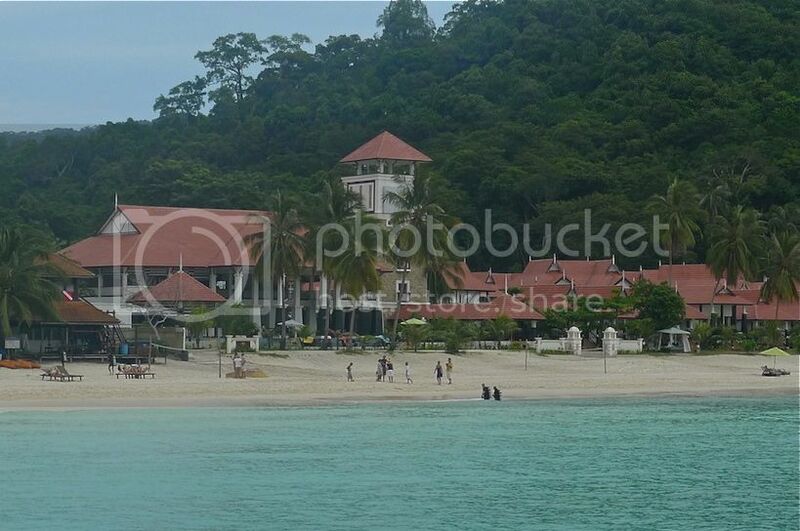 We chose Redang Pelangi Resort because their snorkeling package is the most affordable, according to Jam. Well, he was the one who did the research, not me! LOL! 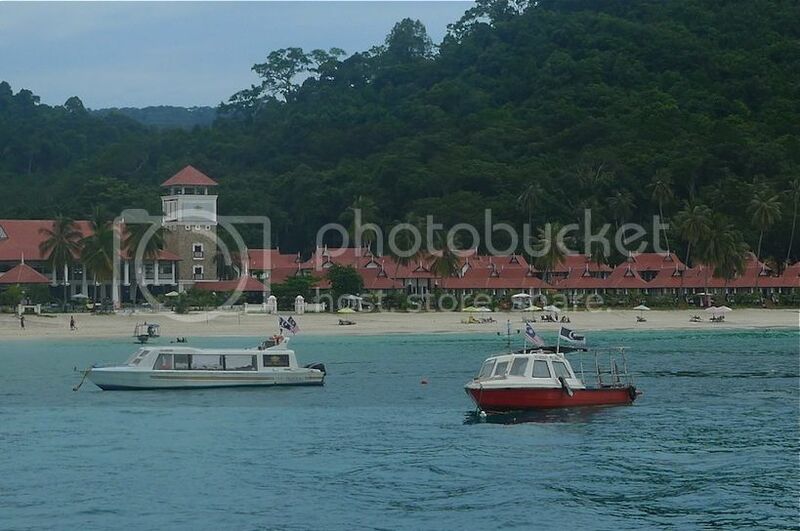 The package which costs RM300 per person, includes 3-day 2-night stay at the resort, plus 3 snorkeling trips (2 at open sea and 1 at Redang Marine Park), and 4 meals per day. I thought the price was pretty reasonable. 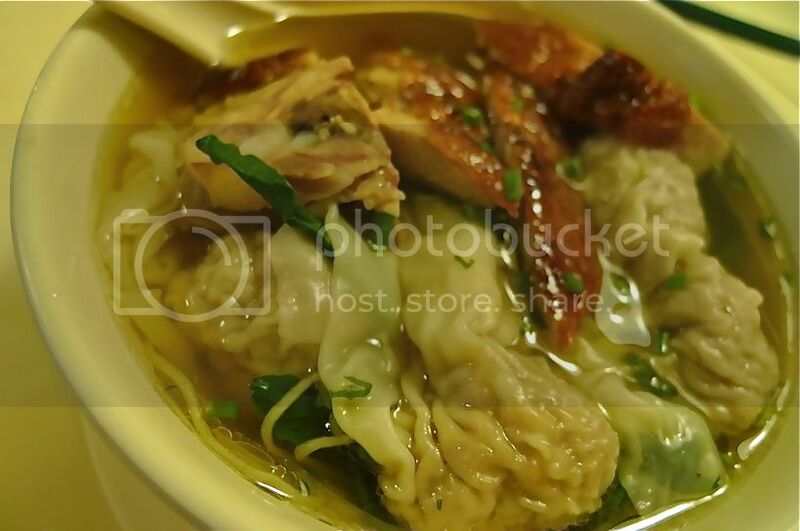 I have to say I enjoyed eating the food there whether it's breakfast, lunch, tea or dinner! Unfortunately, I did not take any photos! 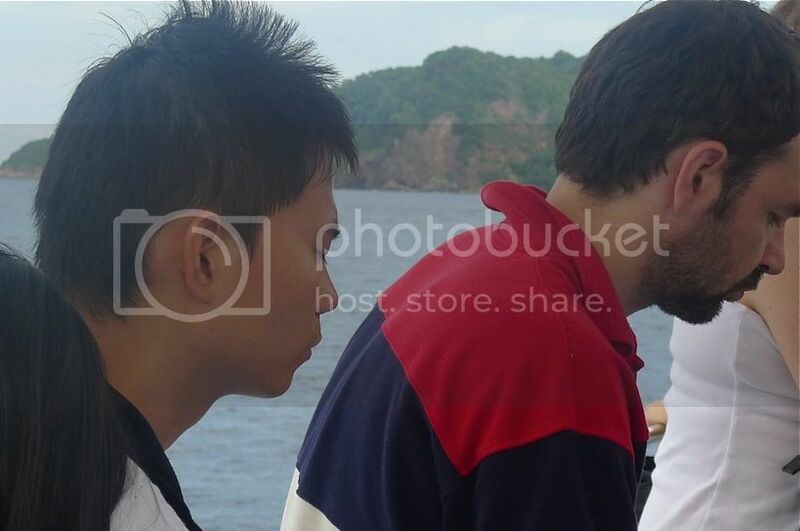 Usually it was eating right after snorkeling or playing by the beach and I was all wet, so how to carry a camera? Too much of a hassle if you ask me! However, I did not like staying in the Redang Pelangi Resort. I guess my main complaint was the low water pressure. We were only staying on the first floor, but the water from the pipes was so small we could hardly wash ourselves after our snorkeling trips! So yes, I would never ever stay in this resort again! By the way, in case you are not aware, I do not know how to swim. Neither do I have the talent for it. And I have never snorkeled in my life before. So I was hoping that Jam would teach me some basics about snorkeling and maybe I could practise in the shallow waters near the beach before going out to sea. It was not to be. 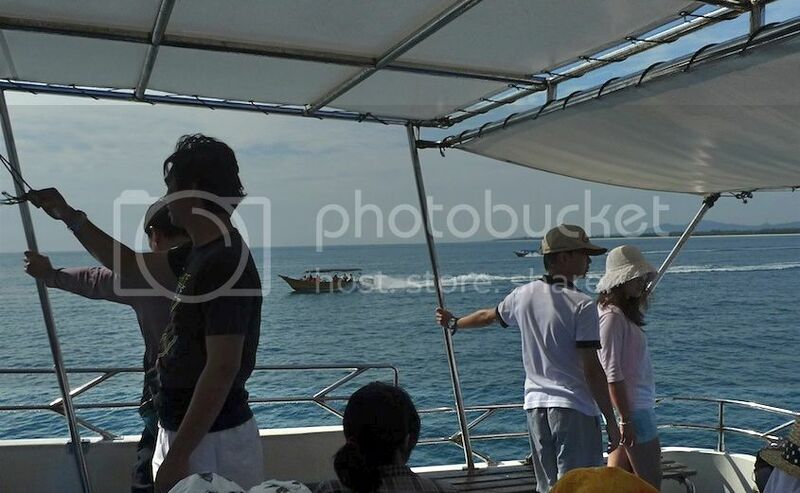 Right after we checked into the resort, we were asked to get ready for our snorkeling trip out in the open sea. It was scary. Would I jump into the deep sea not knowing how to swim? Would I survive my first snorkeling experience? 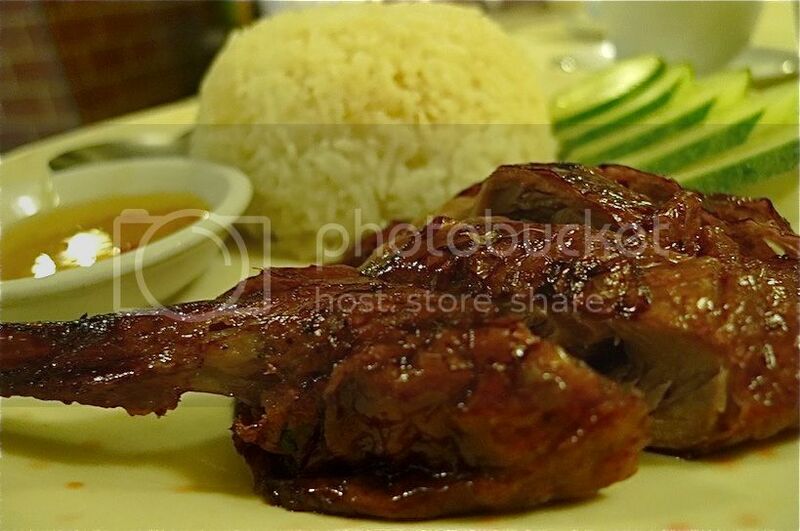 As soon as Jam, his friend and I landed at KLIA-LCCT Airport from Phnom Penh, Cambodia, we went to Taste Of Asia in the airport terminal to have our dinner. 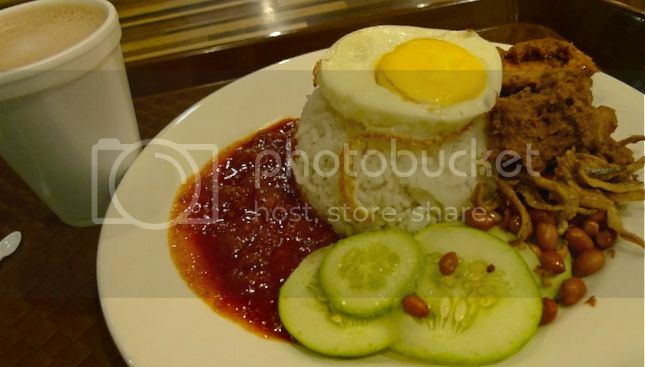 I had nasi lemak and a cup of hot Milo. After dinner, we checked into Tune Hotel which was about 7 minutes walk away. However, lugging our luggage slowed us down and I found that it was not as near as I expected! 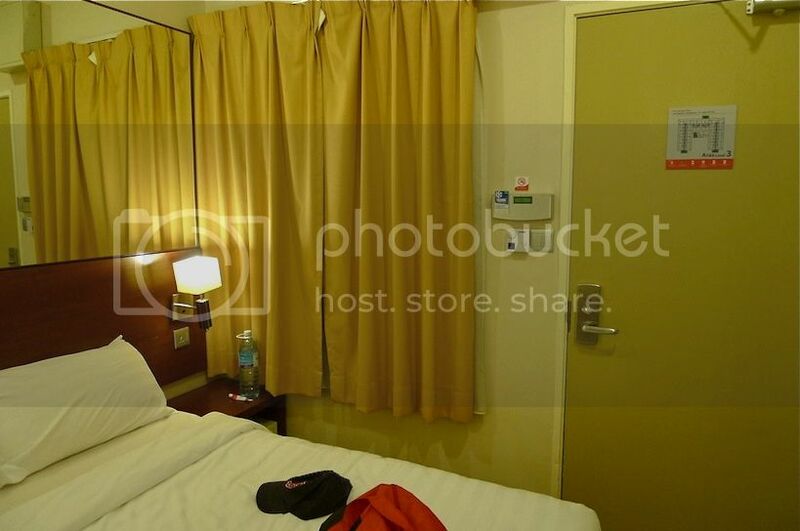 Still, it was the only hotel nearest to LCCT. We had to stay there for the night as we would be taking a flight to Kuala Terengganu at 7am the next day. It was my first time staying in Tune Hotel. There are 222 rooms in this 6-storey hotel. It is a no-frills hotel, not unlike AirAsia flights. 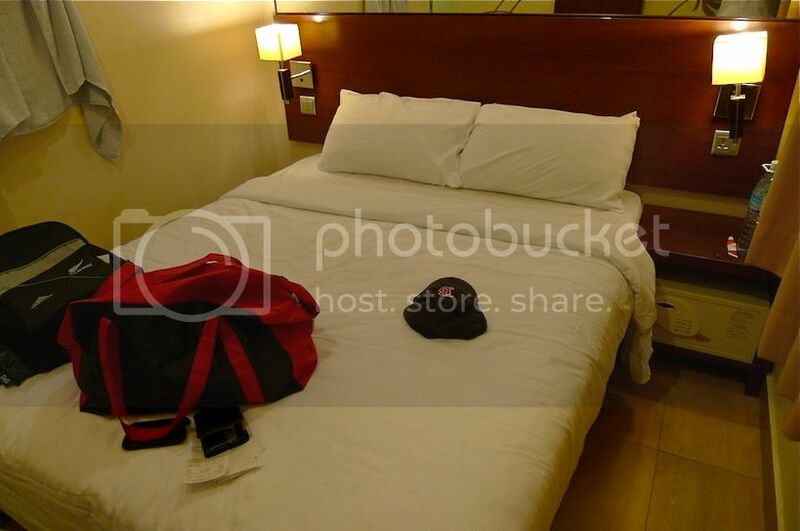 Air conditioning, towels, toiletries and in-room wifi are all chargeable. Since we were just staying there for one night, we did not mind forgoing all these luxuries and settled with the most basic amenities. No 5-star air conditioning for me! 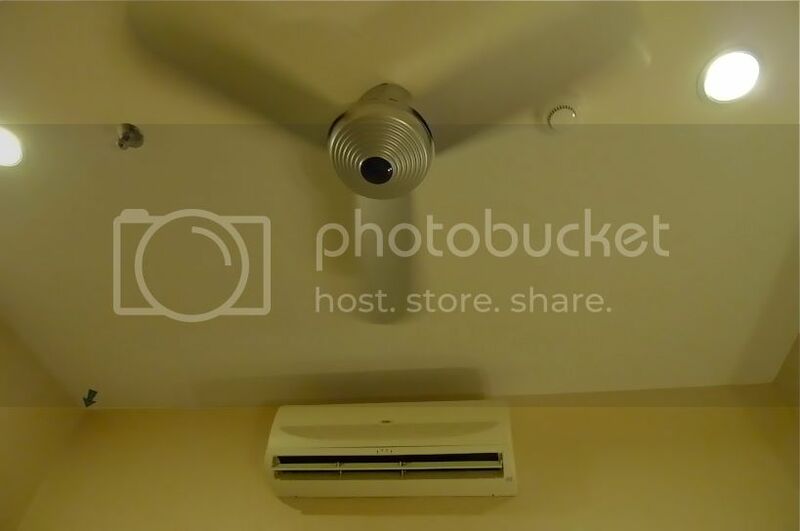 But at least they have a ceiling fan, and thankfully, it's cooling enough for me! The room was actually quite small but I think it's perfect for one person. Two people would be a little crowded, in my opinion. There's hardly space to walk! 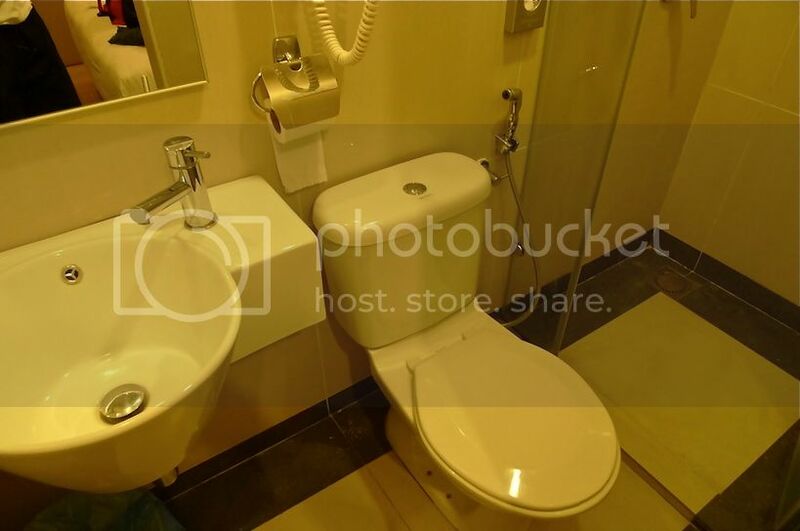 As with any hotel, my first concern is the bathroom. So I had to check it out first! I have to tell you this - only ONE person can walk to the bathroom at any one time as the distance between the bed and the wall is too narrow to accommodate two people! I was quite happy with the bathroom and toilet! It was clean and everything was in good working condition. Of course, I have to say that this hotel was still quite new at that time so there should really be no problems with things not working. 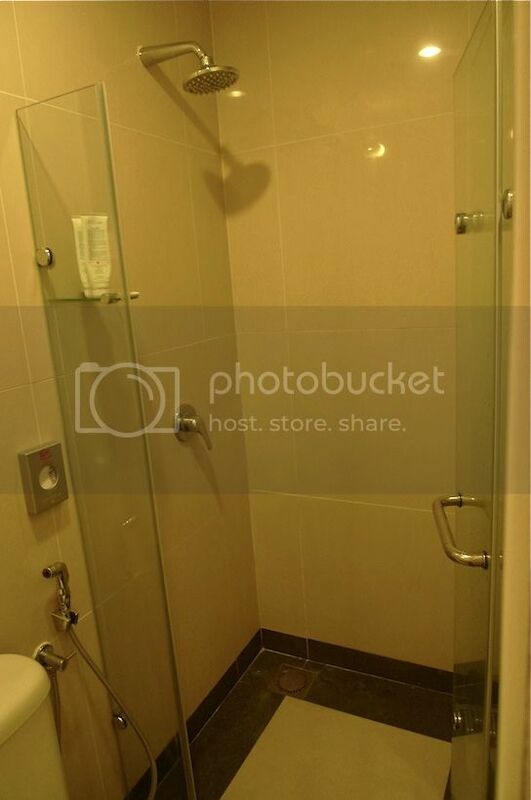 There's even a cubicle for showering which was good as I did not like the bath water to make the toilet section wet, like in some budget hotels. 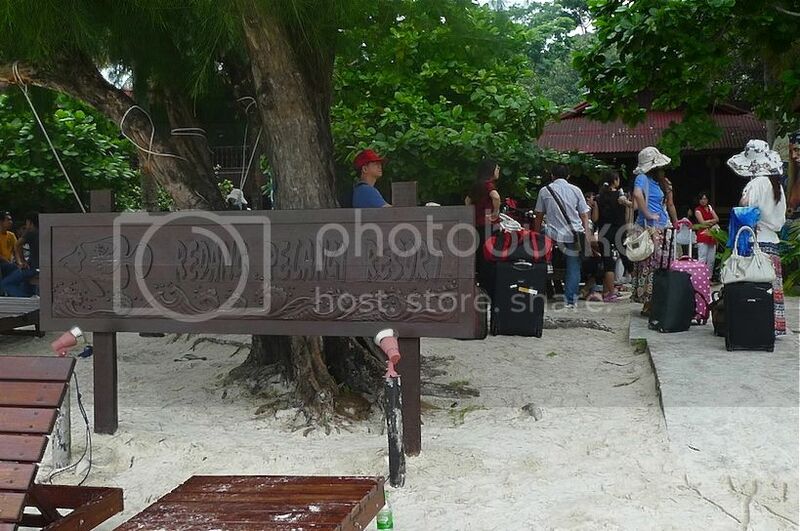 As we would be going to Redang Island the next day, we decided to keep our luggage in Tune Hotel. No point bringing heavy luggage all the way for just 2 nights stay in Redang. However, we were told that we could only do so if we have pre-booked this facility in advance! What a bummer! Left with no choice, we ended up bringing all our heavy luggage on board the boat to Redang Island the next day! Not only that, I had to pay extra for checking-in of luggage at AirAsia as I did not do so online earlier, thinking that we could keep our luggage at Tune Hotel. Lesson learnt! After checking into the hotel, we went to the lobby to go online for a little while as they provide free Internet access there. (We were not willing to pay for the in-room wifi). Then, we walked over to Starbucks in the airport terminal to have a drink and chit chat. When we returned to Tune Hotel, it was almost 2am. I think I only slept one hour. We had to wake up at 4am to catch the 7am flight to Kuala Terengganu. I wasn't sure if I could survive with so little sleep! I think Jam blamed me for bringing him to Starbucks - apparently the coffee kept him awake almost the whole night! LOL! This is my last post on my 6-day trip to Cambodia. Finally! You must be heaving a sigh of relief! But I hoped you have enjoyed reading about my Cambodia trip as much as I have enjoyed writing about it. Jam, his friend and I had spent 3 days in Siem Reap looking at temples and ancient ruins, and another 3 days in Phnom Penh, the capital city of Cambodia. Well, actually to be more exact, it's only 2 days in Phnom Penh, as we took almost a whole day traveling from Siem Reap to Phnom Penh in what must be the slowest bus ride we had ever experienced! There was one thing that we did almost everyday in Cambodia and that was going for massage! Seriously, if you like massage, then Cambodia is a heaven for you. The reason being that it only costs between USD5 - USD7 for an hour's massage! And if you have been to massage places in Malaysia, Thailand, Indonesia or even Philippines, you will know that this rate is dirt cheap! And so on the 6th and final morning in Cambodia, we went for one last massage. We found this outlet called Royal Massage near our hotel - and it turned out to be the best and most professional service we had encountered during our entire trip! Yes, it was only USD6 per hour and I was most satisfied with the massage! Definitely a far cry from the so called 'massage' in our hotel room the night before. After the massage, we went back to our hotel to check out. Our good friend and host (I really am so grateful to him!) who had paid for virtually everything during our 3-days/2-nights stay in Phnom Penh then brought us out to a Chinese restaurant for lunch. During our 3 days in Phnom Penh, we drank beer at almost every meal. That's because our host would always bring along his friend who loves Heineken beer! I am not a beer drinking person, but out of courtesy, we had to drink along with him at every meal. After lunch, our good host drove us to the airport. And while waiting for our plane to arrive, he even bought us ice creams! Can you believe it? I wish I have more of such friends LOL! Now this is a funny ice cream. 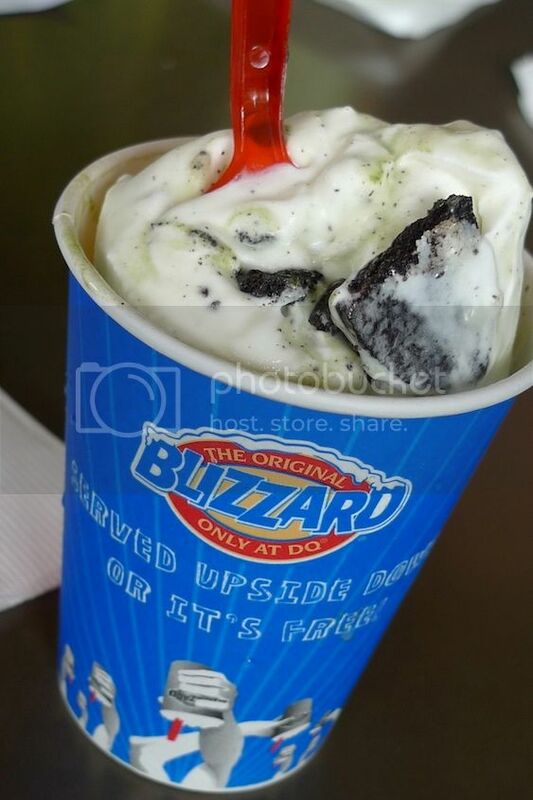 It's called the Original Blizzard ice cream and it is served upside down. If it drops, you get to eat it free! Well, we were not given an 'upside down' ice cream, so Jam tried it on his own. He turned the cup upside down and waited. After a few seconds, the ice cream dropped off! Oops! There went his ice cream! I did not do that so I finished all my ice cream haha! Soon it was time to enter the Departure Hall and we bid our good host and his friend good bye. I enjoyed my Cambodia trip very much and blogging about it helped me to relive those good moments of my life. Now if you have missed any of my Cambodia travel posts, feel free to check them out below, all sorted out in chronological order. So was it home sweet home after I returned from Cambodia? Not so fast!! This was a 10-day holiday plan for Jam, his friend and me, and we had only spent 6 days in Cambodia. Where did we go for the next four days? Well, after accumulating all those dusts from the temple ruins in Cambodia, it's time to wash them off in the waters of Redang Island. Haha! Yes, that's where we headed off for the next few days! Many people do not believe in feng shui. They think it is superstition. Are you one of them? I do not want to convince you or force you to believe in something that you don't. Besides, scientists have not proven that feng shui really exists. But does that mean feng shui is all nonsense? Well, why not put it to the test? Here are 3 tests that you can do. In the year 2012, the Five Yellow is located in the SouthEast. You are not supposed to renovate or disturb this sector of your home or you will suffer from negative effects like severe illness, loss of wealth and other misfortunes. To prove this theory wrong, simply renovate the SouthEast this year! Note : To find the SouthEast sector of your home, you need to stand somewhere in the middle of your house with a compass at waist height. For guidelines on how to get your compass direction right, read HERE. The Three Killings is located at the South sector this year. Renovation and ground breaking in this sector of your home will result in mishaps and accidents, thefts, and persistent health problems. Again to test out the existence of feng shui, disturb the South sector of your home! The Grand Duke Jupiter is located at the SouthEast-1 this year. Disturbing this sector will result in misfortunes, hazards and serious medical setbacks. For skeptics, why not do this - renovate the SouthEast-1 sector of your home! Don't know what the heck is Five Yellow, Three Killings and Grand Duke Jupiter? Well, they are three of the most feared afflictions and they change places every year. For more information, you can read more HERE and HERE. However, be warned. You cannot undo the negative effects once you have triggered them. You can of course, reduce the effects if you take corrective measures immediately after you felt the effects. But you would need to suffer for a while before the effects go away completely. 1. I am currently in Bangkok for a short holiday. I need a holiday and Bangkok seems like a nice place to shop and eat! 2. 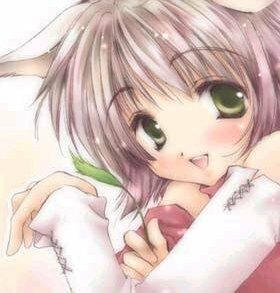 There will be absolutely no pictures in this Random Notes post. Sorry if this bores you, but I will try to keep the post short and to the point! 3. Have you listened to my piano composition? I will be composing another song soon, but meantime, if you have not listened and suggested a title for the song (yes, I have yet to give it a title! ), please go HERE and do so. Thank you! 4. Do you like Starbucks or CoffeeBean? I don't know but I find the coffee is nicer at CoffeeBean! 5. I was searching high and low for the Dentyne chewing gum the other day but could not find them anywhere! Anyone has any idea what happened to Dentyne? Why is it no longer selling in stores? It's my favorite brand for chewing gum! 6. I hope celebrities will quit doing drugs. It's such a waste of talent! Are you ready with your Personal Bazi Chart? You will need it so that you can follow what I am talking about in the rest of this post. As a result, you will see whether this year of the Water Dragon is going to be good or bad for you! Download your Personal Bazi Chart HERE. For those of you who still do not know what a Bazi is, please read Bazi Basics. Before we touch on your Bazi Chart, I would like share with you what Joey Yap thinks about the Mayan calendar and its connection with the Doomsday prophecy. From what we've read, the Mayan calendar ends on 21st December 2012, and this had gotten many people to believe it's the end of the world on that particular day. Joey Yap thinks that is a fallacy and believes the Mayan calendar resets itself after that 21st December 2012. 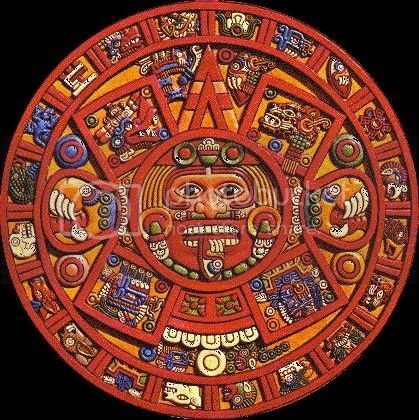 The Mayan calendar, he said, is somewhat similar to the Chinese calendar in that it is perpetual and on-going. He joked that if indeed that's the way to predict the end of the world, then Doomsday must be on the 31st December 2012 since his very own 2012 Tong Shu calendar ends on that date! Haha! By the way, Joey said that if doomsday really were to occur in 2012, he would have no way of predicting it as this 'armageddon' event has never happened before in the history of feng shui, and is never mentioned in the old classical feng shui texts! LOL! 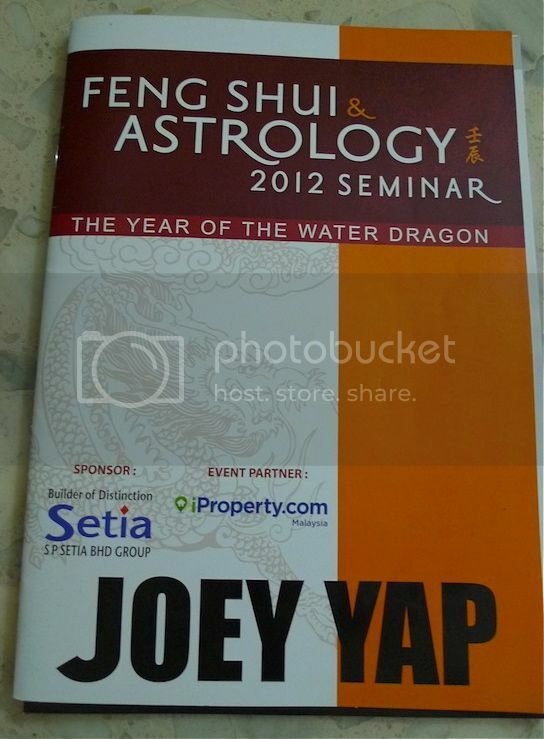 Joey Yap also took a dig at feng shui skeptics. He told us how he argued with a scientist who demanded that he prove that feng shui exists. In return, Joey simply asked the scientist to prove the existence of the mind, which of course the scientist could not. Yet we all know the mind exists. 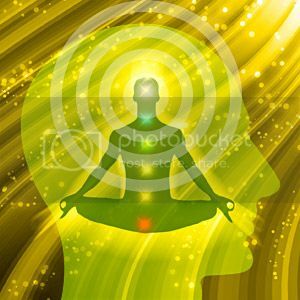 Is the mind in the brain, in our body or outside of it? No one knows, but it is there. Just like the mind, feng shui exists, yet we can't see it. But Joey said you can actually prove the existence of feng shui. 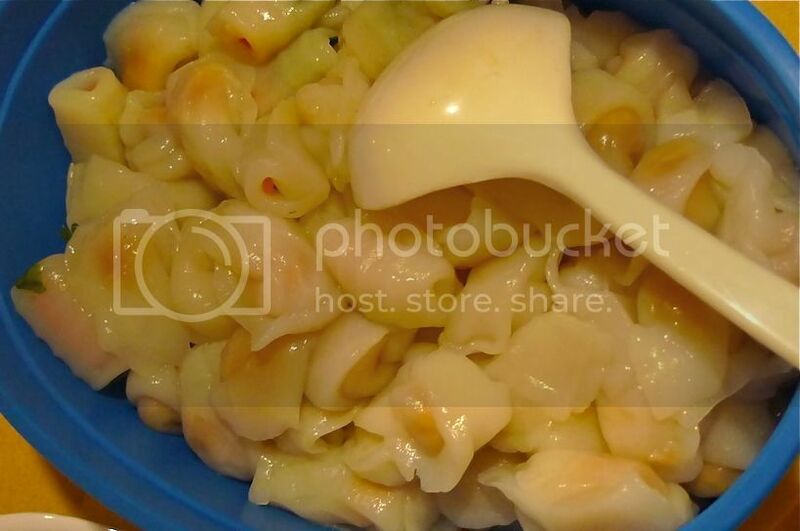 However, I will not be sharing with you how to do so as it will make this post far too long. This interesting topic deserves a post of its own and I shall therefore reserve it for another post. 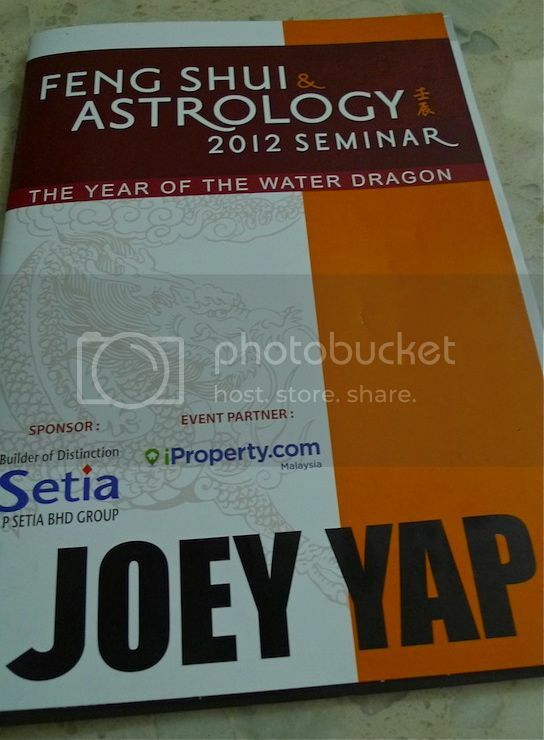 Now let's look at some predictions from Joey Yap for the year 2012. I have already mentioned some of them in Part 1, but here's more. 2012 is the year of the Water Dragon. Water represents cleansing and so, according to Joey Yap, spiritual studies would become very popular this year. Does that mean lots of people will go for things like meditation, yoga, astrology, cosmology, reiki, tarot card reading, and even feng shui this year? Looking at the 2012 Bazi Chart above, you can see that although there are clashes in 3 of the pillars, they are not as bad as the direct clashes of all 4 pillars in the 2011 Bazi Chart. As such, this year will be better than last year. Notice that in the Day Pillar, Wood controls Earth. This means people are going to be richer and unemployment rate will go down. Surely good news, no? Which industry will do well in 2012? According to Joey, Wood is the most favorable element of the year. So wood-based industries like education and health care will thrive this year. If you are thinking of writing a book, perhaps this is a good year to start? Water element industries like transportation, gaming and tourism also look pretty good this year. As water also represents the element of change, expect lots of people to switch jobs and try new things! Fire element industries like IT, telecommunications, airlines and mass media will be quite average. The lack of fire in the 2012 Bazi Chart (only 2 fires exist in the Hidden Stems!) however will help those in this industry, so it will not be that bad. Earth element industries like property, farming and construction will slow down although will not be disastrous. As such, Joey advised us to be more conservative when it comes to property investment. In any case, it is still better for the buyer than the seller, but do buy for the long term. Metal element industries like banking, automotive and insurance are probably going to be the lousiest this year. However, Joey advised that if you are in the industries that are not doing so well, you do not need to switch industry. All you should do is to include the beneficial elements in your work. For this year, the beneficial elements are Wood, Water and Fire. I am not very sure what he meant, but I think it is like this. For example, if you are in the insurance industry and this year is not a good year for insurance. Focus more then on selling medical insurance since health care is a Wood element! For those who are in the know and think I am wrong, please feel free to correct me! Thanks. Now let's take a look at your own Personal Bazi Chart. (Please download HERE if you have not already done so). 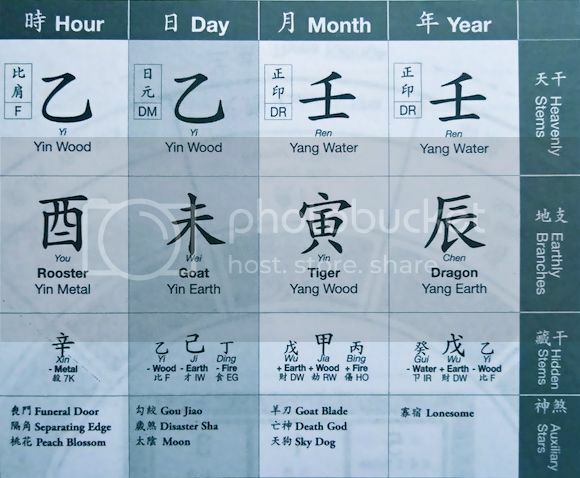 If you can find these 3 beneficial elements - Wood, Water and Fire - in your Bazi Chart, then 2012 is going to be pretty good for you! If you have one or two of the elements, your year is going to be quite OK, but if you have none, oops! Sorry to say 2012 will be a bad year for you! However, do take note that when we read the Bazi Chart, we do not take the fatalistic view. Joey Yap reminded us during the seminar that instead of complaining about things that you CAN'T DO or change, focus on things that you CAN DO to improve your situation. In other words, Bazi reading is not something you read then simply surrender to fate, but rather it is a guide for you so that you can take the appropriate action to improve your life! How do you improve your life this year if you are unfortunate enough to have no Wood, Water or Fire in your Personal Bazi Chart? We'll get to that in my next post, so stay tuned! Now, even if you are not into feng shui, I'm sure you know we are all born under one of the 12 animal signs. Do you know which animal sign are you? Check it out HERE. Of course, if you have your Personal Bazi Chart with you, then the Year Pillar will also tell you what animal sign you belong to. According to Joey Yap, of all the 12 animal signs, the Dog is the unluckiest this year. It directly faces the Grand Duke Jupiter and has absolutely no auspicious stars! If you are a Dog, please do not worry. Your bad luck will only last ONE year. You can always do something about it, which I will reveal in my next post, but the point here is, not to get depressed just because you know that Dogs aren't going to have it good in 2012! But wait! Those of you who are not Dogs do not start celebrating just yet! 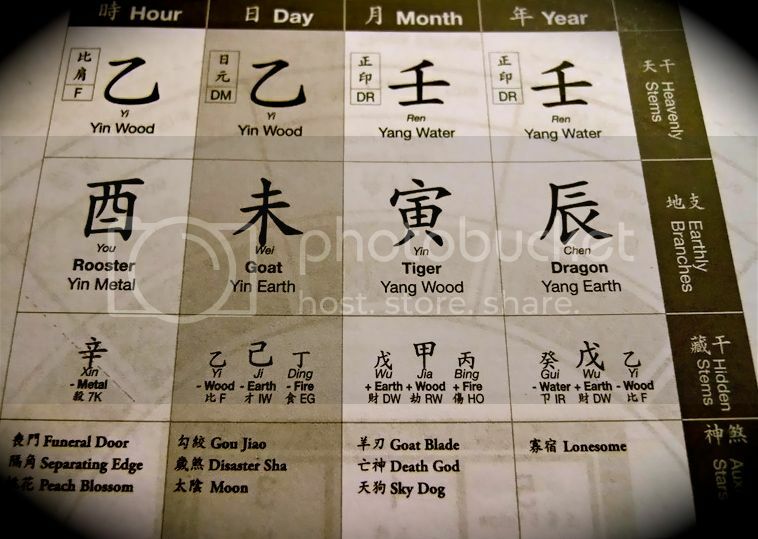 Just because you are not a Dog (which means no Dog in the Year Pillar of your Bazi Chart), does not mean you do not have a Dog in the Hour, Day and Month pillars! As long as you have a Dog (or worse, more than one Dog!) in your Bazi Chart, things don't look too good! In your Personal Bazi Chart, each of the 4 pillars represents different things. The Year pillar represents your social life, the Month pillar represents your job and career, the Day pillar is about relationships and domestic issues and the Hour pillar is about your thoughts and actions. So if you have a Dog in your Year pillar, you will most likely have problems in your social circle, particularly with friends. If Dog is found in your Month pillar, there will be problems with your job and career. Those working for others will most likely have more problems, though. If you have Dog in your Day pillar, then you may suffer from relationship and health problems and if the Dog is in your Hour pillar, you may make make silly decisions and act impulsively that may affect your reputation. Having access to this information can prove to be a life saver! For example, if you have a Dog in your Day pillar, then you will need to be extra patient and tolerant in your relationships with your loved ones to avoid any quarrels. You also need to take care of your health and do a medical check-up early to prevent any illnesses. If you have a Dog in your Hour pillar, it is better for you to stop and think first before you act. It is also best not to change job or start a new business since you are prone to making bad decisions. If you are already in business, try to do more planning instead of executing new plans. During the seminar, Joey Yap also introduced the Xuan Kong Nine Life Star. I was totally new to the Nine Life Star since I have never been exposed to it before. 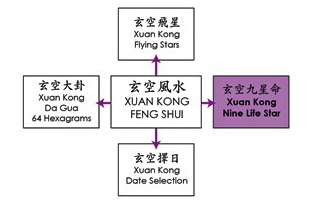 I have learnt about Xuan Kong Flying Stars before but not the Nine Life Stars, which is actually a component from the Xuan Kong feng shui system as shown by this diagram below. Needless to say, I was a little blur when Joey talked about this topic, but luckily, I managed to catch some important points. 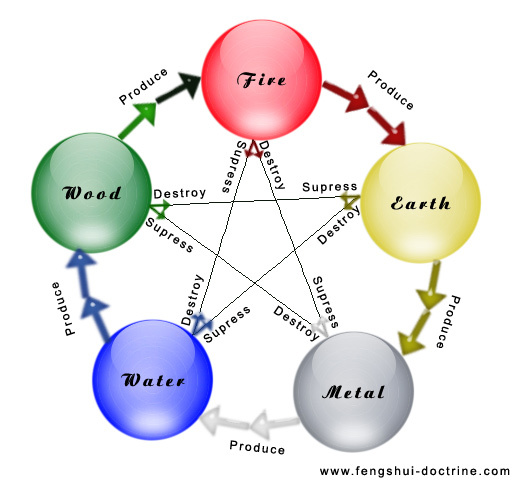 I have to say, if you are totally new to feng shui, you may have some problem following Joey Yap in his seminar, so if you plan to attend his seminar next year (which I am very sure will happen, Doomsday prophecy notwithstanding), I would advise you to learn some feng shui basics from his books first! Anyway, this is the 9 Life Star. Each person belongs to one of the nine Life Star. Which one are you? To know that, you will need to look at the top right corner of your Personal Bazi Chart print-out if you have downloaded from the site I recommended above. Or, you can find out by entering your date of birth and gender HERE. In my next post, I will share with you which Life Star number will enjoy a fantastic year in 2012 and which will not have it so good. But do not worry if you are not going to have a lucky year. There are always ways to make things better and one very good way is to activate all the good sectors in your home! However, you can only do so if you activate the correct sector at the correct time! So make sure you do not miss out my next post coming right up! One evening, I was at my piano and suddenly out or nowhere, a tune came into my mind. I played it out and then realized I had just composed a short song! I decided I had better record my own composition before I forgot how it sounded like. You know, without writing the music notes down (which is a tedious job!) that melody can be gone forever! I am thankful I have my iPhone by my side all the time - it's a lifesaver! The recording function of the iPhone is really pretty good so I quickly whipped out the iPhone, clicked on the recording app and recorded my own playing. I wonder if musicians do the same whenever they are hit by a sudden inspiration - a sudden tune that appears in their heads - that they know will be a good potential to be the next major hit on the charts? Don't be surprised if you hear people talking or whispering in this recording. You did not imagine it! Haha! During my playing, I was interrupted by two naughty kids but thankfully, I was able to play the whole song without any major disturbances! So please excuse all the unwanted noises, but then again, I thought they blended in with the music quite well. LOL! Well, hope you like this composition of mine. Don't forget to suggest a title for this song. ENJOY!! 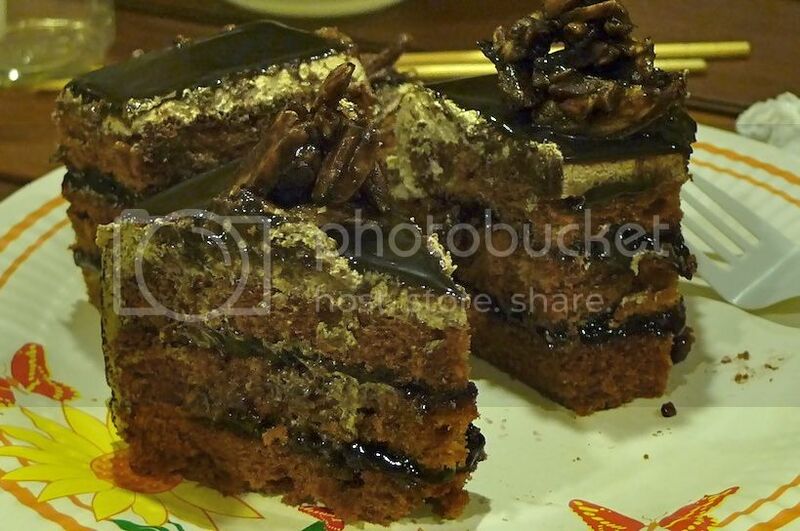 This work and recording is copyrighted. 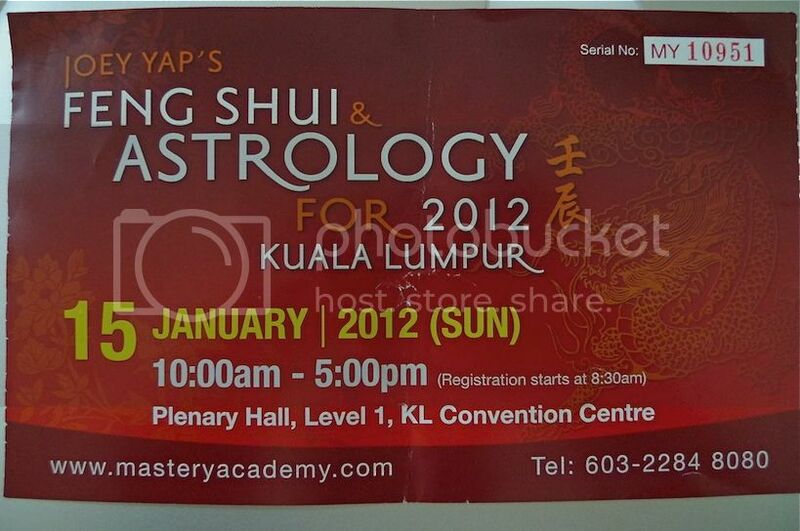 This year, I went to Joey Yap's Feng Shui & Astrology Seminar in KL Convention Centre twice. That's right. The first was on Saturday, 14th January, which was the Cantonese version and the second was the following day on the 15th, which was the English version. It was my first time attending Joey Yap's Cantonese seminar and I have to say it was more fun than his English seminar! Perhaps it was his chemistry with TV and radio personality Angel Wong (more popularly known as Chui Ling) that made it more entertaining and fun. She was there on stage the whole time and her funny banters with Joey Yap kept me and the audiences in stitches. In contrast, Joey's English seminar was not as fun, although still enjoyable. He conducted the seminar by himself with no one to help make it more lively. Having said that, Joey still managed to entertain us with his jokes and wit. If I had not attended the Cantonese version, I would not have made this comparison and would still very much enjoy his English seminar. I actually arrived a little late for the English seminar on that Sunday and it was full house! 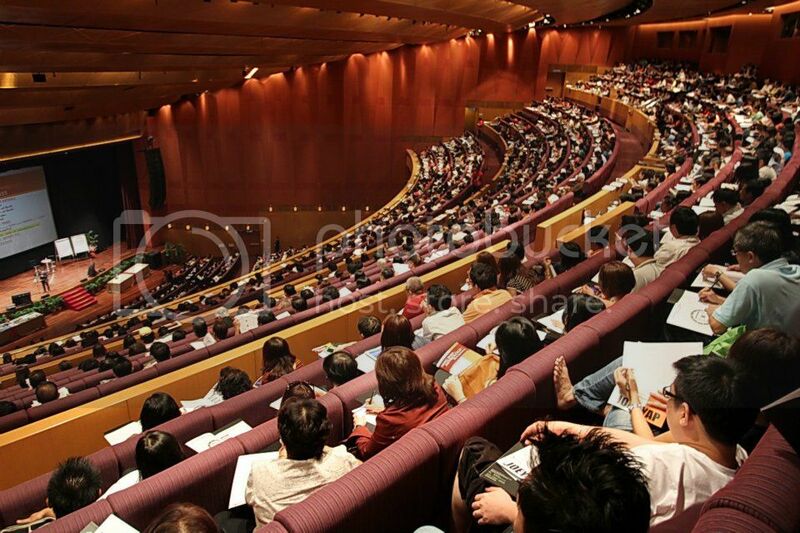 Look at this picture of the Plenary Hall where the seminar was being held. The Cantonese seminar was not as full but I have a feeling it's going to get more and more popular in future. Joey Yap was excellent in his command of the Cantonese dialect and he was able to spew forth many Chinese proverbs during his talk, some of which were really funny. I found it quite difficult to take down notes during his Cantonese seminar as I was not able to write in Mandarin and had to translate what he said from Cantonese to English. So perhaps it was a good thing I attended his English seminar as well. LOL! Joey Yap started the seminar with a brief review of the predictions he made last year. I actually could not remember what he said as I did not note them down during his Cantonese seminar and I was late for the English seminar so I missed that part! However, I remember he mentioned about the Five Yellow being in the East last year. (Read my post on his 2011 feng shui talk HERE). Five Yellow, if you do not know, is the most dreaded star in Flying Star feng shui. And the East is China, but the East of China is Japan. That probably explains the horrible tsunami in Japan last year. Joey Yap taught us to read the Bazi Chart and the Flying Star Chart. Like any feng shui practitioner, he also based his predictions for the year 2012 by analyzing the Bazi Chart and also the Flying Star Chart. 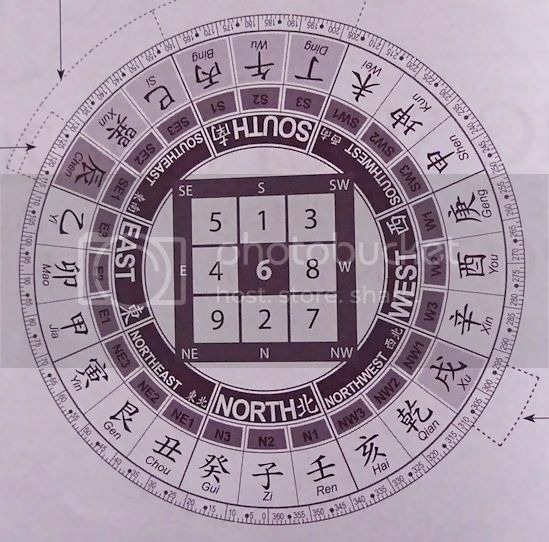 We were also asked to print out our own personal Bazi Chart so that we may refer to it during the seminar. Look at the 2012 Bazi Chart below. As you can see, there are water and wood elements in the chart. Joey Yap said this indicates flood. Where will the flood happen? As you can see, the Five Yellow (number 5) is located at the SouthEast this year. So, it is safe to say that the flood will occur in SouthEast countries which are countries like Malaysia, Thailand, Philippines, Singapore and Indonesia. However, since Malaysia is a Rooster (independence year 1957 is a Rooster year) and Singapore is a Snake (independence year 1965 is a Snake year), these two countries would not be badly affected by the floods. Sorry, I have forgotten the reason why. Anyone knows? Please enlighten me - thank you! 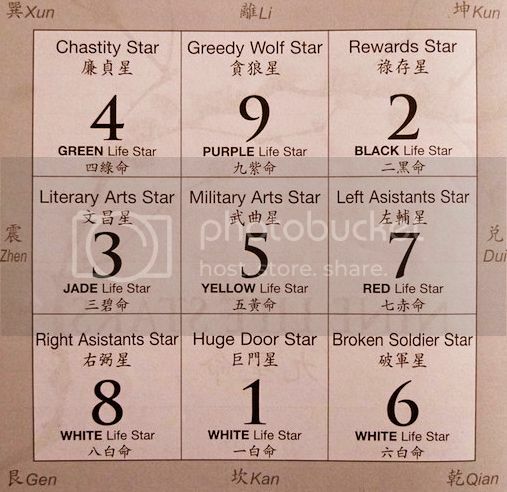 Looking at the Flying Star Chart again, you can see that number 8 is in the West this year. Star 8 is a wealth star, so any country in this sector would benefit from it. On the world map, we all know that USA is in the West, therefore Joey Yap concluded that the economy in the USA should be quite OK this year, and most likely be better than last year. Americans can heave a sigh of relief! Joey Yap also taught us to superimpose the compass onto the map of Malaysia. By doing so, you will find that Kuala Lumpur is located at the western sector, therefore KL will enjoy good feng shui in 2012. Similarly, you can zoom in (using Google Map) and see which town or city in Malaysia is located in the West sector. At the seminar, he pointed out that Subang, Shah Alam and Klang are all good places in 2012. Possibly good places to buy house or do business? Of course to think long term, you will have to analyse the Flying Star Chart for the years ahead, not just 2012. You can do the same for any country in the world, so if you are not living in Malaysia, try it out on your own country. Looking at the Flying Star Chart again, you can see number 6 in the middle. 6 represents heaven, space, or sky. And since this is a Water Dragon year, and we know water flows downwards, Joey Yap concluded that something will fall from the sky! Could it be asteroids? Meteorites? Or a dysfunctional satellite? I know I am just giving a very simple analysis. It's a brief summary of what Joey Yap said. In actual fact, the analysis was more complex than this! It's definitely not just based on the number 6 and Water Dragon! I definitely still have a lot to learn! Now I have forgotten how Joey analyzed this, but he mentioned that there would probably be earthquake in Taiwan and Indonesia this year. So be warned! In my next post, I shall delve into more predictions for the year 2012 by Joey Yap, his interesting thoughts about the Mayan calendar and Doomsday, plus some predictions based on your own personal Bazi Chart so make sure you have it ready! You can download your personal Bazi Chart HERE. Also not forgetting the important dates and times to activate the good stars and avoid the bad ones! 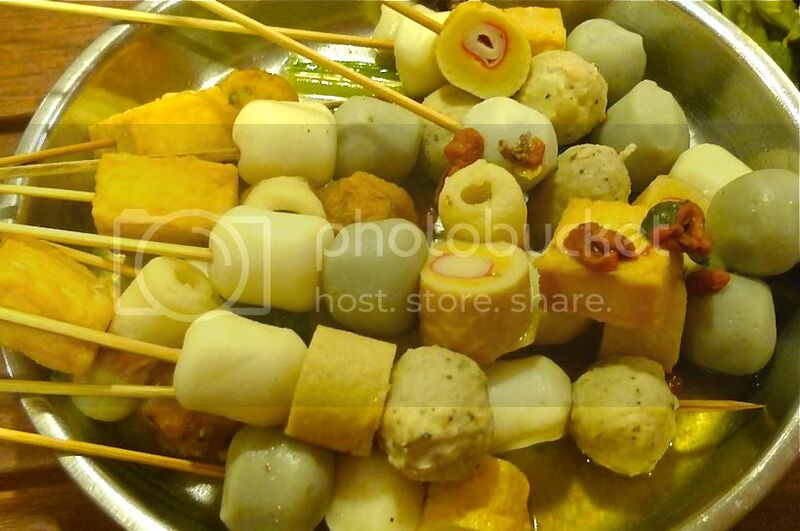 Last night, I went to my friend's house for her annual steamboat potluck party. I had been going to her potluck party every year since 2009. I blogged about it last year and also in 2010 and 2009. 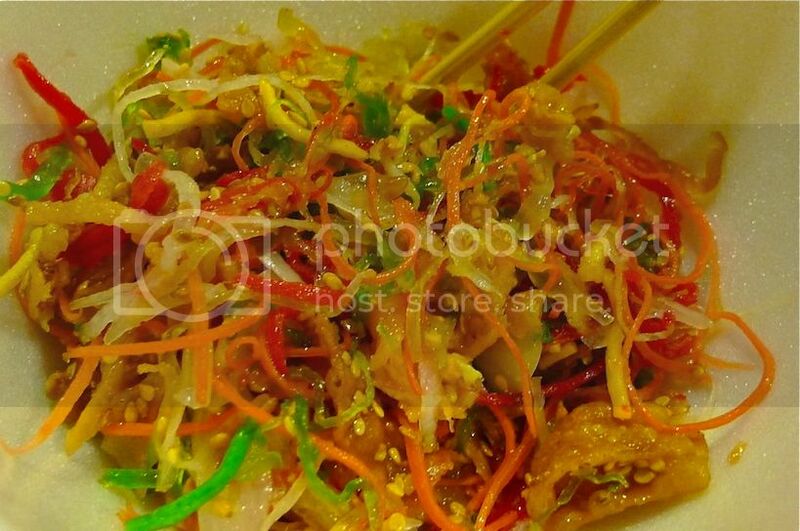 This year, it coincided with the Chinese New Year so we had yee sang as well. 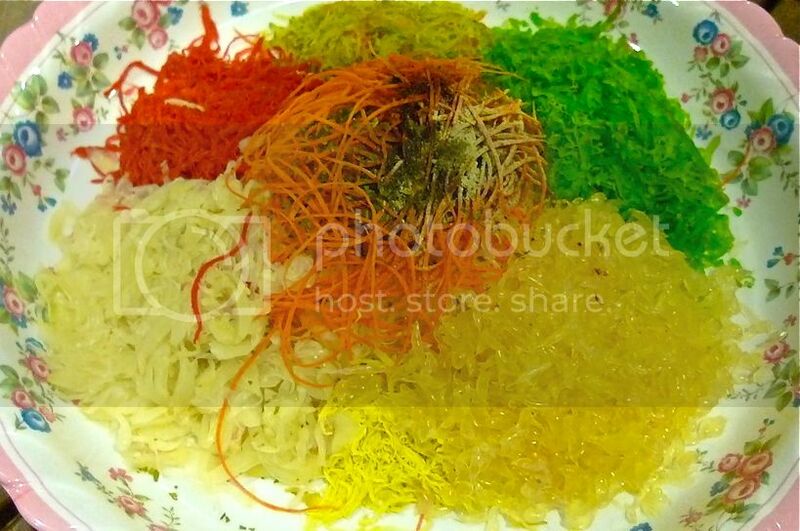 Since it's a potluck party, I decided to contribute the yee sang with 2 other friends. 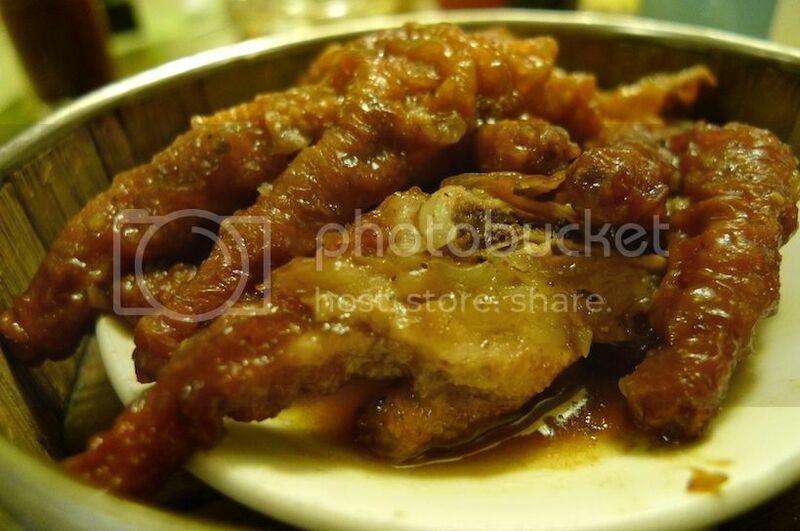 We bought it from Sri Siam Restaurant in SS2. OK, the yee sang did not exactly look appetizing but after we tossed and mixed all the ingredients, it looked yummy and delicious! This is my bowl of yee sang! 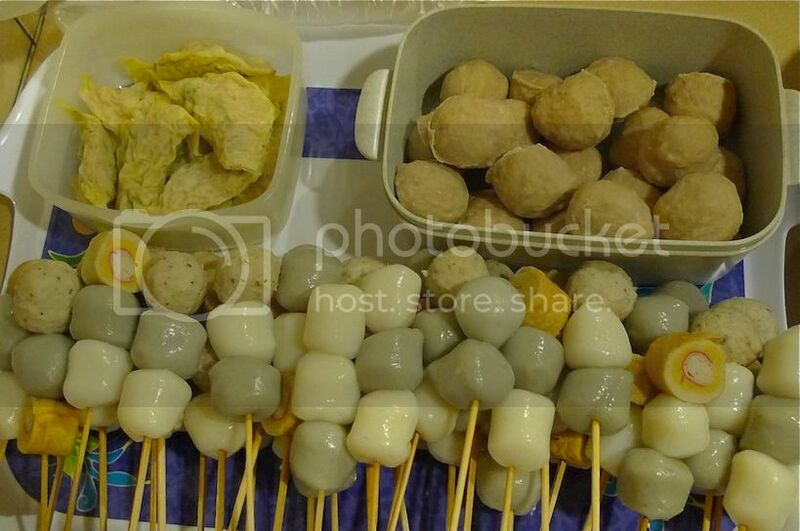 Unlike the normal steamboat where you dip the raw meat and vegetables into the boiling pot and take them out with chopsticks or ladles, my friend had ingeniously used skewers instead. This way is more hygienic and easier for us too! Meat balls all neatly prepared by the host. We just need to dip them into the boiling pot. 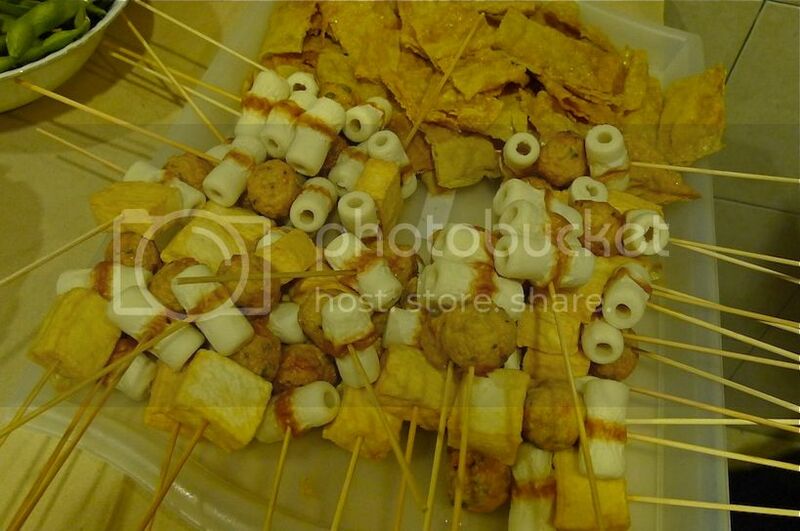 More raw stuffs to be put into the steamboat. 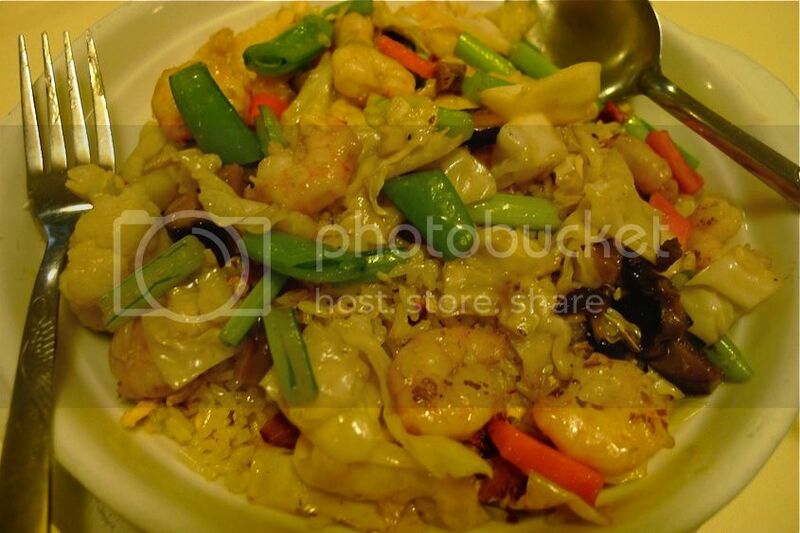 There were prawns too but I forgot to take photos of them! 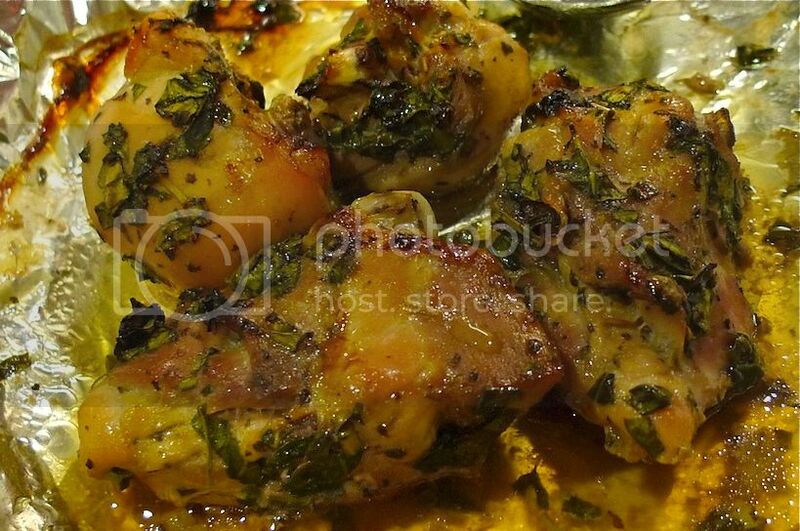 These are cooked meat balls ready to be eaten with some chili sauce. 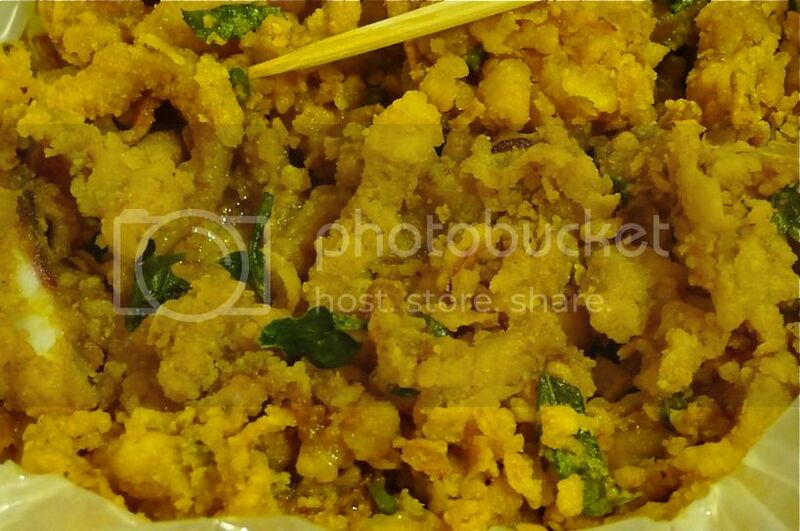 A friend brought fried squids. 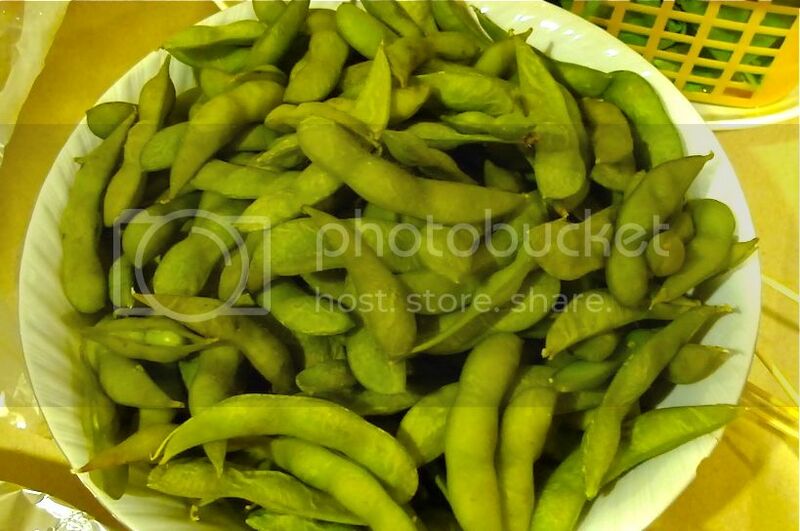 The host also prepared for us a big plate of edamame beans - my favorite! I think I ate way too many edamame beans last night! 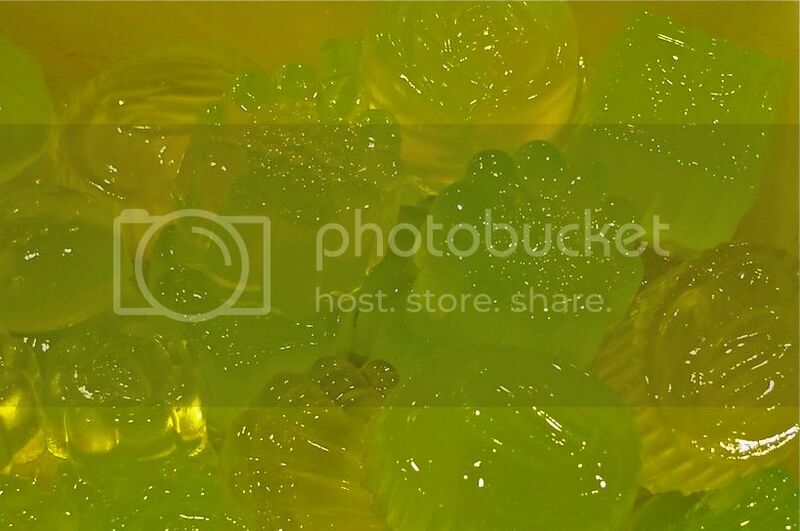 For desserts, we had konyaku jelly. Yum! I totally enjoyed myself at the potluck party. I will definitely go again next year if I'm invited again! 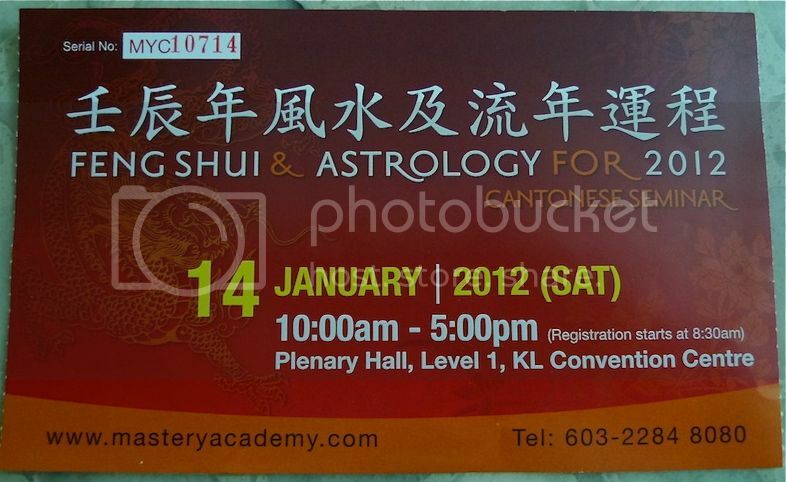 Important : Due to my post "2012 Feng Shui According To Joey Yap" being delayed, I need to inform those of you who practise feng shui that today, 6th Feb 2012 at 11.30am, it is highly recommended that you activate your NorthEast-1 sector of your home to attract wealth (except if you have rabbit in your Bazi Chart).